KANSAS CITY, Mo. – The largest remaining intact sections of the Panthéon de la Guerre have been on exhibit at the National World War I Museum and Memorial for nearly 60 years. 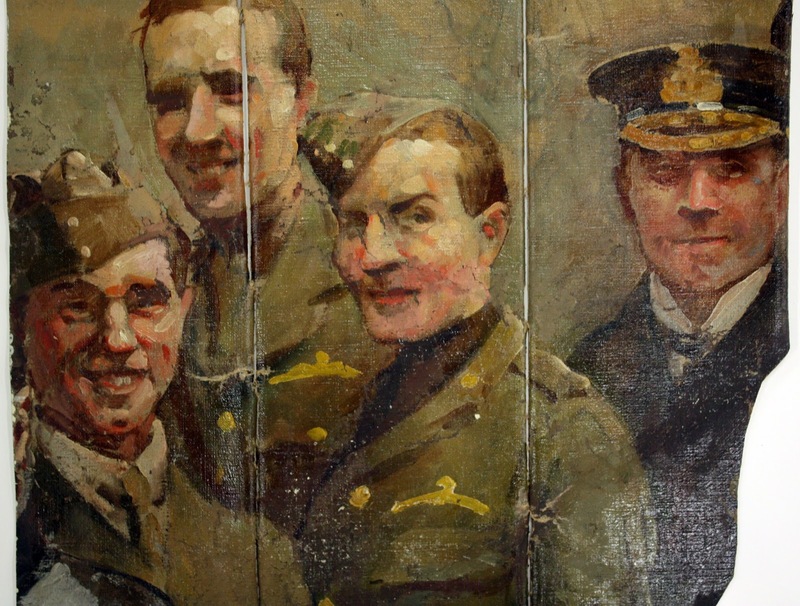 For the first time, since the painting was last shown in its entirety 75 years ago, the public has the opportunity to view additional fragments from the world’s largest painting. Rearranging History: Daniel MacMorris and the Panthéon de la Guerre, a new special exhibition at the National World War I Museum and Memorial, helps answer the question: what happened to the world’s largest painting? At 402 feet in circumference and 45 feet in height, the Panthéon de la Guerre was not only the most ambitious artistic undertaking during World War I, but upon completion in 1918, it was the largest painting in the world at more than 18,000 square feet. Forgotten after exhibitions in Europe and the United States, when artist Daniel MacMorris (1893-1981) learned from a 1953 Life magazine article that the Panthéon was in the U. S., he saw a golden opportunity. MacMorris, who was in charge of decorating the Liberty Memorial, knew the panorama intimately. He had seen it in Paris as a doughboy and had studied it closely in the 1920s as a student of the Panthéon artist Auguste Gorguet. MacMorris thought the Panthéon would be perfect for the one remaining wall in Memory Hall without a mural. After acquiring the painting, MacMorris photographed it in detail. He cut out the figures in the photos and used these like movable puzzle pieces to work out how best to reduce and reconfigure the composition – an effort he compared to “whittling down a novel to Reader’s Digest condensation.” After deciding whom to include and where to place them, he took scissors to the canvas. He cut out selected figures, flags, and other passages and added these to either side of the original American section. What happened to the unused portions of the original? By far most of what MacMorris did not use he threw away. He sent several larger, excised passages back to William Haussner, the Baltimore restaurateur and art collector who donated the Panthéon to the Liberty Memorial. Haussner displayed many of these in his eponymous restaurant until it closed in 1999, after which they were sold at auction. 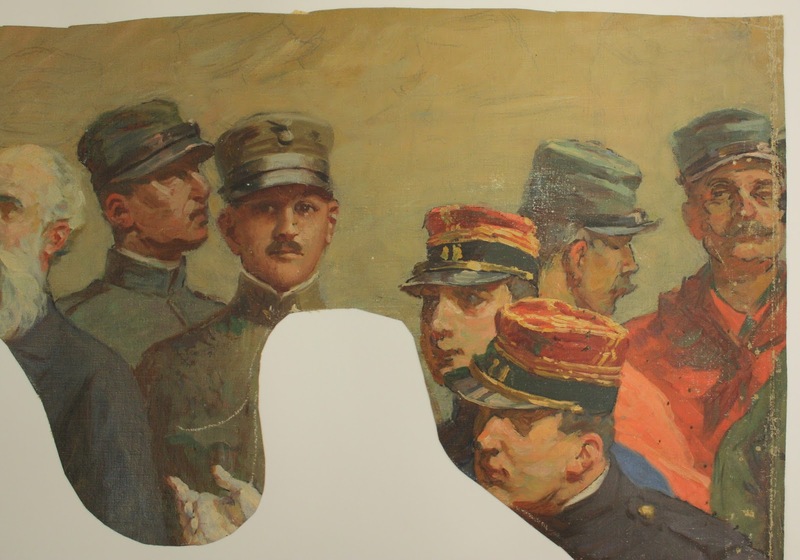 MacMorris doled out other pieces to the art students who helped him reconfigure the painting. Still others he gave to influential Kansas Citians, some of whom have since donated the fragments back to the Museum. 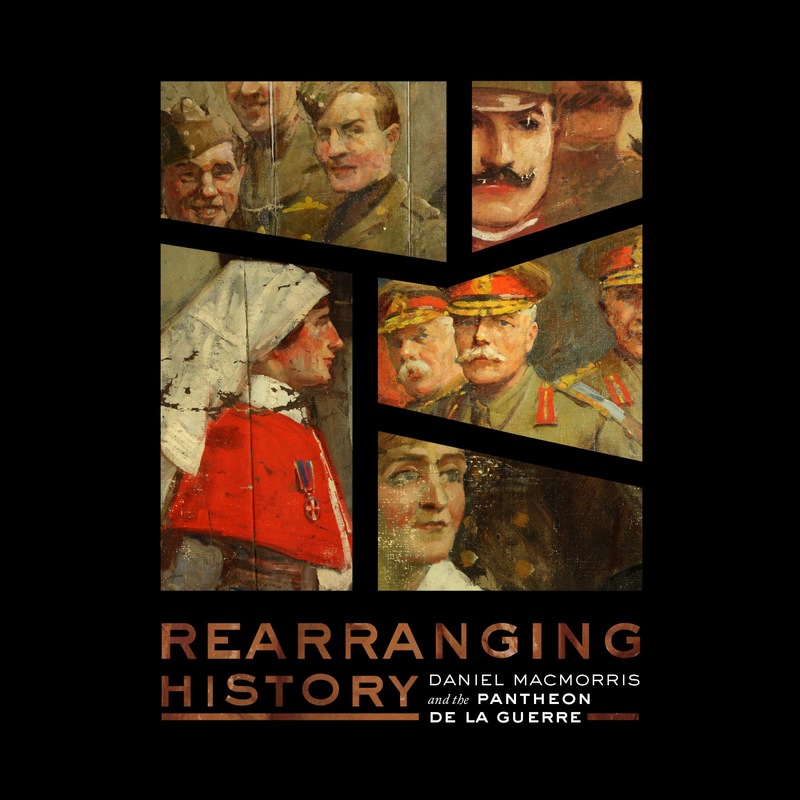 Rearranging History: Daniel MacMorris and the Panthéon de la Guerre is open Tuesday, Dec. 15 through March 27, 2016 in Memory Hall.